Full working weekends are exhilarating but demanding, and I thought I might never get out for a walk on a beach this weekend. I was quite accepting of this however. After all, I had met up with some old school friends from the 1960s at the Gormanston reunion in Bewley’s Hotel, Ballsbirdge, on Friday night, and over the three days between Friday and today [19 April 2015] I had a number of walks along the banks of the River Dodder in Rathfarnham on my way to and from work. I was surprised on Friday night to meet another Gormanston “old boy” who was a regular reader of this blog and who lives next door to the house on Rathfarnham Road which had been one of my childhood homes. I passed the house again this afternoon as I was walking home in the afternoon sunshine, and thought I might watch either the Aston Villa semi-final fixture against Liverpool or the Leinster rugby clincher. But then, against all expectations, I ended up having a late lunch at Carpe Diem in Bray, and then going for a short walk along the Promenade and by the beach. Immediately after their marriage, my parents lived briefly in Bray, although I never lived in that house. My mother also had a cousin who once owned an hotel in Bray, although I have yet to find out which hotel. I know the stories of my Comerford and Lynders family roots on my father’s side of the family, but have yet to learn about the stories of my mother’s Murphy and Crowley ancestors. However, I recently learned my mother’s uncle, my grandmother’s brother, once lived for a short time in Shanganagh Castle, on the northern fringes of Bray. Cornelius (‘Con’) Denis Crowley (1879-1972), originally from Millstreet, Co Cork, lived at Finnstown House, Lucan, Co Dublin, and was a director of the Roscrea Meat Company with Robert Briscoe, TD, his brother Jeremiah D. Crowley, and G Fasenfeld. The Crowley family, who made their fortune through canning meat in the 1930s and the 1940s, and continue to farm near Finnstown House. But they sold Finnstown House and the immediate grounds and it is now Finnstown Castle Hotel. A cousin recently told me how the Crowley family had also owned Shanganagh Castle for a brief period in the mid-20th century, and so I stopped on the way home this evening to have a look at this house and to photograph it, although it is now a building site as Dún Laoghaire Rathdown County Council works on its restoration. Dún Laoghaire Rathdown Council acquired Shanganagh Castle in a land swap with developers about 18 months ago [September 2013], along with a number of buildings on the site and about 6.35 acres of land around the castle. Shanganagh Castle is close to Shanganagh Cemetery, Saint James’s Church, Crinken, and Woodbrook Golf Club. When the council acquired the castle, it was in a very poor condition, and the current restoration plan is budgeted at €500,000. It involves emergency work to stop further water damage and the deterioration of the building, and the demolition of a 1950s dormitory block beside the castle. The plans are part of a larger vision for the completion of Shanganagh Regional Park. Shanganagh Castle is a two-storey over basement castellated house, with some small third-storey rooms in the roof and in the turrets. It stands on the site of an earlier castle built in 1408 by the Lawless family. The castle continued in the Lawless family until 1683, when it was leased to Sir Thomas Domvile. But it returned to the Lawless family again some 30 years later. In 1763 a fire left the castle in ruins, and the first phase of the present castle was probably built in the 1760s. The second phase was designed by the neo-classical architect, Richard Morrison, in 1805-1818 for Major-General Sir George Cockburn (1763-1847), the most notable owner of the castle. As a general, Cockburn had travelled throughout Europe during the Napoleonic Wars. While he was in Italy he acquired many treasures, including marble sculptures, architectural fragments, pictures and statues. He supported political reform, advocated greater democracy, sought to curb the political influence for the aristocracy, and called for greater civil rights for Catholics. After buying Shanganagh Castle, Cockburn commissioned Sir Richard Morrison (1767–1849) to remodel the house externally as a romantic castellated house in the neo-Gothic style. He also added a top-lit picture gallery to the north, which survives in altered form behind the modern dormitory block. The internal plasterwork was the work of the stuccodore James Talbot who worked on many of Morrison’s buildings. Morrison and his son, William Vitruvius Morrison (1794-1838), were two of the most prominent architects in early 19th century Ireland. Richard Morrison developed the neo-Gothic style of James Wyatt, and his work includes the Anatomy House at Trinity College Dublin, Sir Patrick Dun’s Hospital, Dublin, Lyons House, Co Kildare, and the spire of Cashel Cathedral (1807). With his son, he also designed Ballyfin House, Co Laois, Kilruddery House, Co Wicklow, Fota House, Co Cork, and Baron’s Court, Co Tyrone. On the other hand, a sad account of the later career of James Talbot of Stephen Street was given by his fellow-tradesmen in March 1834. He had been “the best workman in the Trade,” they recalled, enjoying an “extensive” business and employing 12 men. But by about 1816 his business had begun to decline and it had collapsed by 1818. He had died in the North Dublin workhouse. In 1818 Cockburn wrote a letter, intended for posterity, which he concealed in a bottle in one of the newly built turrets of the house. This bottle was found during refurbishment work in 1954. In the letter Cockburn describes the alterations he is making to the house, discusses the history of the area, the politics of the day, religion and the military exploits of Napoleon. 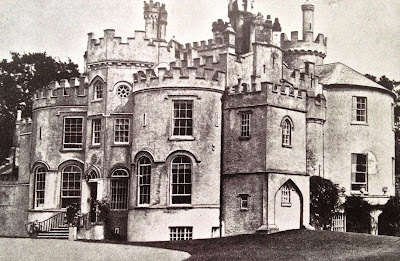 After the Crowley family had been owners of Shanganagh Castle in the mid-20th century, it was extended in the 1950s for use as a Church of Ireland College of Education. From 1969, it was used as an open prison for juveniles until it was closed in 2003. Shanganagh Castle has been vacant ever since, and is now fenced off from the public as restoration work is carried on. Hopefully the castle will soon be open to the public and I have the opportunity to see inside and learn more about the Crowley family’s connections with Shanganagh Castle.